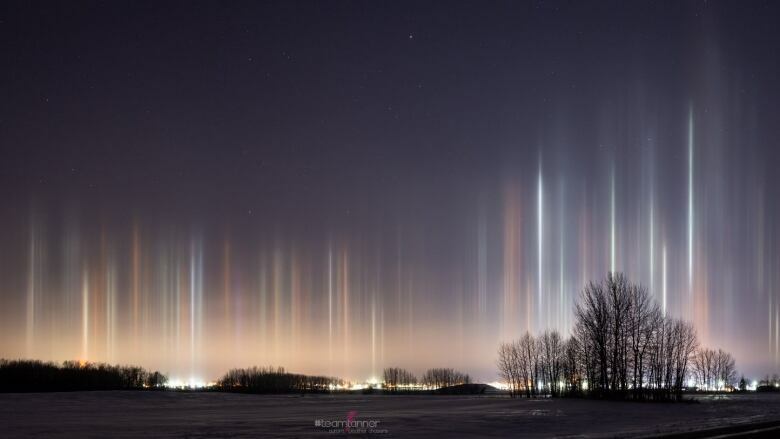 Icy weather gripping Western Canada is illuminating the night sky above Alberta with strange columns of light. Darlene Tanner, a photographer who specializes in capturing storms and other night sky sights, has been among the skywatchers lucky enough to glimpse a strange phenomenon called light pillars. "You just have to be out there to actually see them," Tanner said in an interview Tuesday with CBC Radio's Edmonton AM. Beams of white, purple and pink filled the sky over the central Alberta city of Lacombe around 4 a.m. Sunday, Tanner said. The ethereal sight is sometimes confused with something extraterrestrial, she said. "Sometimes they don't form until the middle of the night when people are sleeping but they look just like UFOs or alien lights." While light pillars are not rare, few people get the chance to see them, Tanner said. "Sometimes they're different colours, depending on the light source that they're coming from, so they can be blue, orange or pink, yellow or all white." Light pillars, large beams of light which appear to be reaching up from the Earth, materialize when either natural or artificial light bounces off ice crystals suspended low in the atmosphere. "The ice crystals act like tiny little mirrors and they reflect light from the ground back towards us," said Ian Doktor, a physics and astronomy teacher at Edmonton's Jasper Place High School. The recent cold snap has made for the perfect conditions for light pillars, sometimes mistaken for northern lights, Doktor said. Skywatchers willing to brave the cold temperatures may be rewarded with a stunning light show, he said. "They usually only form when you have enough ice crystals in the atmosphere. Fortunately for us, it's been pretty cold lately, so that's one thing we have in abundance now."